Oakville Cross as the name indicates is a tribute to location – in this case the Oakville Cross Road. It can take longer for some for the “allure of Napa” to take hold than others. Jack and Ruthie Rydman moved to the Napa Valley in 1973 and have been living at their current location since 1974. They remember that much of Oakville Cross Road was already planted to grapevines – even in the early 1970’s. Historically their property was site to a prune orchard – in fact one of the original buildings that housed the dehydrator for the prunes is still standing. In later years walnuts grew on what was to become their small vineyard. While there have been vineyards planted in this part of Oakville for many years the wineries on Oakville Cross road are much newer. 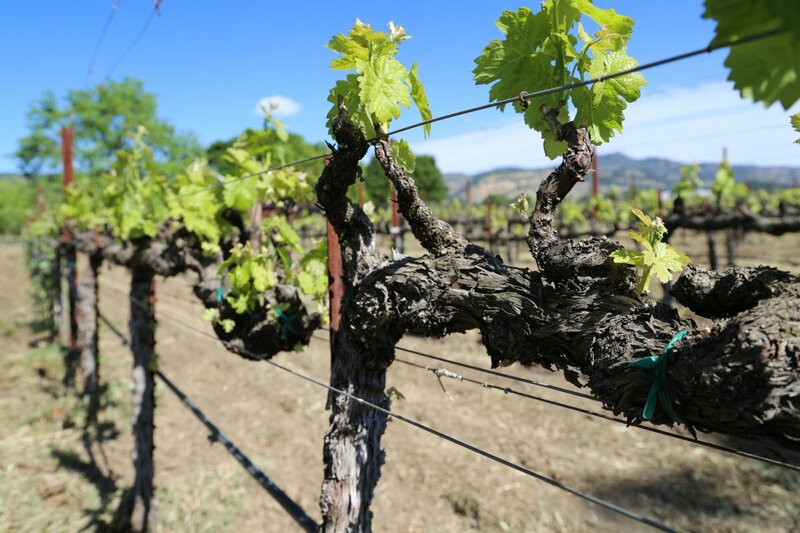 When the Rydman’s moved here, big name wineries such as Silver Oak had yet just released their first commercial vintage a year before, Groth, and Plumpjack came much later. When the Rydman’s decided to plant a vineyard one of their easiest decisions was by far which varietal to plant. 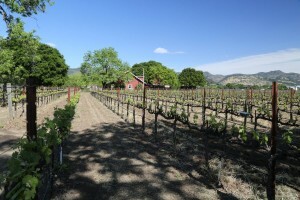 Needless to say, this is the “center” of Oakville and is one of Napa’s sweet spots for growing Cabernet. The vineyard was planted in 1999 and for several years they exclusively sold the fruit to other wineries. In 2005 they decided to make wine although they still sell a small amount of fruit. In order to put “Oakville” on the label they need to use 85% of the fruit from the appellation each year. They make one wine annually – a Cabernet Sauvignon that is blended with small amounts of grapes from select other Napa vineyards. They have found a balance between using French and Hungarian oak with small amounts of American Oak used during the aging. The 2007 Cabernet Sauvignon is blended with Merlot, Cabernet Franc and Petit Verdot. It is dark in the glass. The bouquet is certainly ripe but it does not fall over the edge into jamminess or super ripeness. This big and showy bouquet reveals ripe blackberry, black cherry, black currant – with a somewhat liqueur and or floral note to the aroma. Aromatically from the bouquet, one expects very ripe fruit to dominate on the palate but that is not the case. Rather the palate features a balance yet at the same time a complexity of flavor. It shows dark fruit, notes of cedar and a touch of vanilla on the soft finish. The tannins are well managed – delicate and smooth from mid palate to the finish. This wine is well balanced between fruit and structure throughout. Jack is adamant about eliminating cork taint. During a trade show he came across a glass enclosure called the Vino-Seal. He then spent significant time researching the benefits of using this particular enclosure and contacted several local wineries who had done extensive research and were already using this enclosure. The Rydman’s have been very happy with this type of enclosure – restaurants and wine shops love it because they are assured of no taint and its easy to remove from a bottle. It is not yet used in large production in the valley (the cost is similar to a good quality cork) and mobile bottling lines are not yet tooled to automatically seal this type of closure and sealing must still be done by hand. Their label is based on an original painting by local artist Earl Thollander (died in 2001) who painted a number of scenes in the Napa Valley. Jack kept meaning to have Earl paint a scene from their property but as luck would have it, his wife presented him a painting of their house (painted by Earl) for one of his birthdays. The label depicts their property and home. A local winemaker, John Gilpin has been making their wine for a number of years. While Napa as a whole focuses on quality over quantity – you can still find value at a number of price points. This is one of them – considering their location and the price point of some of their neighbors. 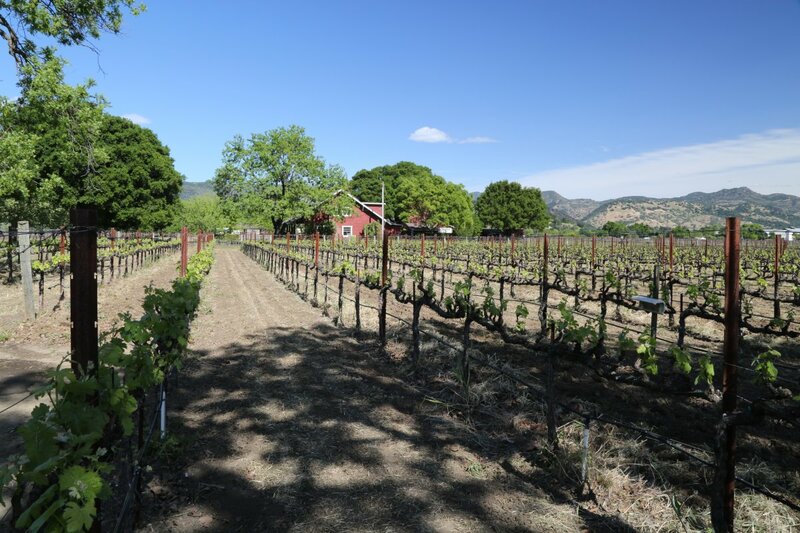 You can find their wine at a number of local restaurants including Cook in St. Helena and Brix in Yountville as well as the Napa General Store in downtown Napa and Sunshine Market in St. Helena.